A great option to enhance programming at schools, early learning centres, festivals, outdoor events, libraries, museums, bookstores… you name it! Workshops are the perfect solution if you are looking for educational enhancement to compliment your programs or events. These 30-45 minute music and movement workshops are available for children under age 7 and can easily be tailored to suit your needs. Whether you are looking for a regular weekly program throughout the school year, a 4 to 8 week session or a one time music class to tie in to a holiday theme or a school theme, we can accommodate your needs. We bring everything to you and our workshops include plenty of percussive instruments, singing, dancing, movement and tons of fun, with an option to add home materials. Sing Music Studio has created an exclusive program for babies and toddlers based on American Sign Language. Research has proven that using ASL with babies and toddlers can aide in communication and learning. 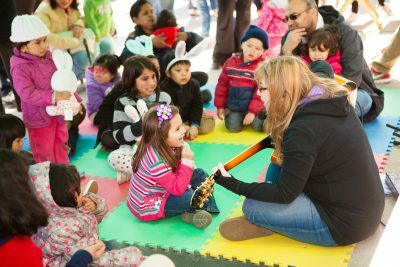 Our comprehensive program brings music and ASL together with the additional use of props, age-appropriate instruments and visuals creating new tools in learning and communication for use between babies and toddlers with educators and/or parents. There are currently 12 themed units available, each with a pdf of ASL signs to aide the educator and/or parent in continuing to use the ASL signs outside of workshops. For all of our workshops, our one time booking fee is $150 plus HST. Discounted rates are available for repeat bookings and successive bookings. We can provide many options such as quarterly, monthly, or 4 to 12 week programs. To find out more about our school programs and workshops and what options will work for your establishment, contact us. © 2019 Sing Music Studio. All Rights Reserved. Designed by Evolve Artistic and Developed by Code Diva.